Ever since James Cameron's blockbuster movie Titanic, there has been much debate over whether or not there was a watertight door indicator panel. 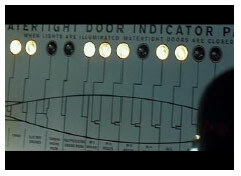 This panel, as seen in the movie, would have individual lights that would light up as the automatic watertight doors closed. It is commonly believed, and accepted, by Titanic experts, that such a device was never installed on the Olympic, before 1913, and as such, one was never installed on the Titanic either. This belief is furthered by testimonial evidence presented during the US Inquiry into the loss of Titanic. On day four, Third Officer Pitman, would be asked about the presence of such a device. Senator Smith: All right; I just wanted to know if you knew about it of your own knowledge. Is there any way for an officer on watch to tell whether the doors actually close when he works the lever from the bridge? Pitman: No; I do not think there is. Senator Smith: In order to have a perfect test, it would be necessary to have some one below, would it not? Senator Smith: Did you ever operate a lever on a door of a watertight compartment. Senator Smith :But it stands to reason, and your judgment as a navigator is, that operating the lever from the bridge you can not tell with exactness whether the doors have closed below or not? Pitman: No. Anyhow, the watertight doors were of very little assistance this time. On day seven, Quartermaster Olliver would also be questioned about the topic. Senator Burton: Was there an instrument there to show the doors as they closed? Did you ever see one of those instruments? Olliver: No; I never saw one. Senator Burton: With little lights that burn up as each door closes, and then go out? Senator Burton: There was no instrument like that on the Titanic? Olliver: I did not see that. Senator Burton: Would you have seen it if it had been there? Olliver: No doubt I would, sir. As can be seen, neither Olliver nor Pitman relate having seen such a device. Being that both men worked on the bridge, it seems reasonable that, had there been one, they would have known about it. Research shows that after Olympic's maiden voyage, Chief Engineer Bell (who would later go on to be Chief Engineer of Titanic, and lose his life), would make the following remark, “I consider that a “tell tale” indicating on the bridge when the doors are closed would be an improvement.”i This at least suggests that Olympic did not have a light panel indicator, at least on its 'bridge', during its maiden voyage. Would Bell have made such a suggestion if there was one elsewhere? Under such suggestion would White Star have ignored it and not install one on Titanic? If Bell's suggestion did fall on deaf ears, the question would be why? It may be because Titanic's watertight door system was state of the art back then. Titanic was fitted with twelve automatic closing watertight doors on its tank top level. The doors where, “A heavy cast iron door sliding in a heavy cast iron frame, the two being carefully machined and the frame having wedges on it so that when the door was lowered it was wedged home and the two machined faces coming together were made watertight,” and were, “arm controlled from four positions. Electrically, from the bridge, by hand, from the deck at the top of the bulkheads; by hand, adjacent to the doors, and by a float under the floors.”ii Via the bridge, there was no way to work the doors independently of one another. Due to the fact that these doors closed under their own weight, it was apparently felt that the system was fail safe, and it did not require the bridge knowing whether the doors had closed or not. Though this seems haphazard, it should be remembered that this very system lead to the belief that the ship was 'practically unsinkable'. The location of the activation 'switch' or 'lever' (as it was referred to in the testimonies) has also been under much discussion. Olympic's switch, it is believed, was located in the chartroomiv. A 1913 notebook from a Harland and Wolff worker, has an entry dated March 1913, that states, “Closing doors also operated from Captain's Bridge. Tell-tale indicator on bridge for each door show whether closed.” The reader may have noted the mention that Olympic's doors were operated from the 'Captain's Bridge' and not the chartroom. Was the switch or lever moved? Or have historians mistaken the placement of the switch? Scribbled, as a side note, next to the suggestion, it reads: 'Central Control Gears do this'. This reference to 'central control' is in reference to the type of watertight doors that can be activated from a central location (i.e. the bridge) . Of the services performed by electricity incident to safeguarding life at sea, there is none more important, perhaps, than the operation of the watertight bulkhead doors which may be operated individually or collectively from the bridge of the vessel. In this connection it may be mentioned that there has lately been inaugurated an agitation in favor of making these doors smaller in order that they may be more easily operated. In the latest approved system of electrically operated bulkhead door an electric bell sounds in each compartment that is to be closed for some seconds before the doors close, in order to allow time for the egress of any persons who may be in the compartments. Electric indicators in the chart house or on the bridge also indicate at all times just which doors are closed and which are open. Though this in no way determines rather or not Titanic had such a device, it does suggest a possibility that, if anything, such a device was located in the chartroom if not on the bridge. As mentioned, Olympic's watertight door lever may have been located in it's chartroom. Could the suggestion for improvement, made by Chief Engineer Bell, actually have been to have a light indicator panel moved, and not necessarily have one installed? Unfortunately, suggestions and indications seems to be all that we have. That is until now! In this debate it was once stated, “I can't prove ... that a system didn't exist, because I can't dig up proof of something's non-existence, short of having a witness or publication specifically state that the system wasn't there.”vi However, finally there is evidence that one did exist! Attached to the wall of the navigating room a most important piece of apparatus is the electric indicator for the watertight bulkhead doors. This provides means of observing the closing of all the doors and stopping the inflow of water in case of collision. The doors are closed by hydraulic pressure and as they swing too, tiny electric lights within the indicator show exactly which doors are closed or open. This, quite possibly, is the definitive answer, as to whether or not Olympic had a watertight door indicator panel before 1913. Of course this article only speaks of the Olympic, and not the Titanic; but, would Harland & Wolff have installed one on Olympic, and not Titanic? This seems doubtful. 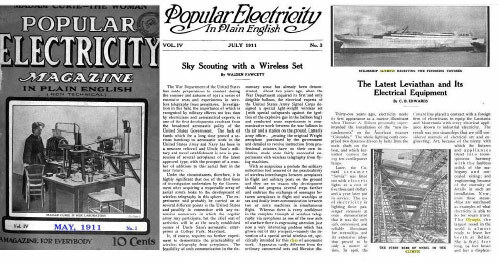 So even though there is testimonial evidence that Titanic did not have an indicator panelix, this above article clearly suggests otherwise. vii Offical Designation of the “Olympic Class”?